If there was a moment of absolute clarity where one can perceive the nothingness and unity of all things, and at the same time gain positive enlightenment as a result, that period is Zen. Manila, Philippines -- Zen Buddhism is one of the foundations of the Japanese culture. In A.D. 794 Japan’s capital shifted from Narra to Kyoto, and for more than a thousand years remained as the center of government. Although Tokyo is the present capital of the country, it cannot be denied that much of old Japan remains in Kyoto, which to this day is clearly the major cultural center of Japan. 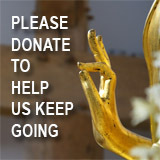 Buddhism came to Japan in the 6th century initially competing with existing Shinto beliefs, Japan’s native religion. The former was originally passed on from Korea, and later from China. After hundreds of years, Zen Buddhism was established as a complex form of Buddhism particularly favored by the military class and was Japan’s distinctive contribution to the religion. Zen is a shortened form of Zenna from the Sanskrit term "dhyânam," which means meditation or contemplation. One of the central practices of Zen is Zazen, which means to meditate in a sitting position. Another is through Koan, the telling of certain stories and anecdotes (e.g. if a leaf falls inside a forest, does it make a sound?) pertaining to Zen and meditating on the deep questions and answers they elicit. Zen Buddhism involves introspective meditation, and through a disciplined simple lifestyle, a person can let go of worldly desires and achieve enlightenment, which is the main goal of Buddhism in general. 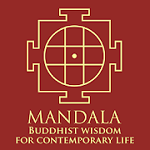 By calming the mind, sitting meditation and emptying one’s self, a person can dispel and discover self-knowledge. 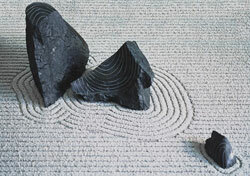 Zen gardens are designed for practitioners of Zen to induce contemplation and meditation. The garden is both a philosophical statement and an object of aesthetic appreciation. Japanese gardens aim to imitate nature and the Holy Land for Zen garden enthusiasts are still in Kyoto, which has hundreds of Buddhist temples and monasteries. Everything is simplified and distractions are eliminated. The dry garden of Roanji in Kyoto is the best example of a Zen garden (created in 1500 by Soami). The main elements comprise of rocks and sand—the sea is symbolized by furrows in a layer of sand suggesting ripples; rocks suggestive of a waterfall; and 15 stones forming islands in a sea of raked pebbles. A true haven for one’s personal search for tranquility. What is your moment of Zen?